This tutorial will show you how to add a second Samba4 domain controller, provisioned on Ubuntu 16.04 server, to the existing Samba AD DC forest in order to provide a degree of load balancing/failover for some crucial AD DC services, especially for services such as DNS and AD DC LDAP schema with SAM database. 1. 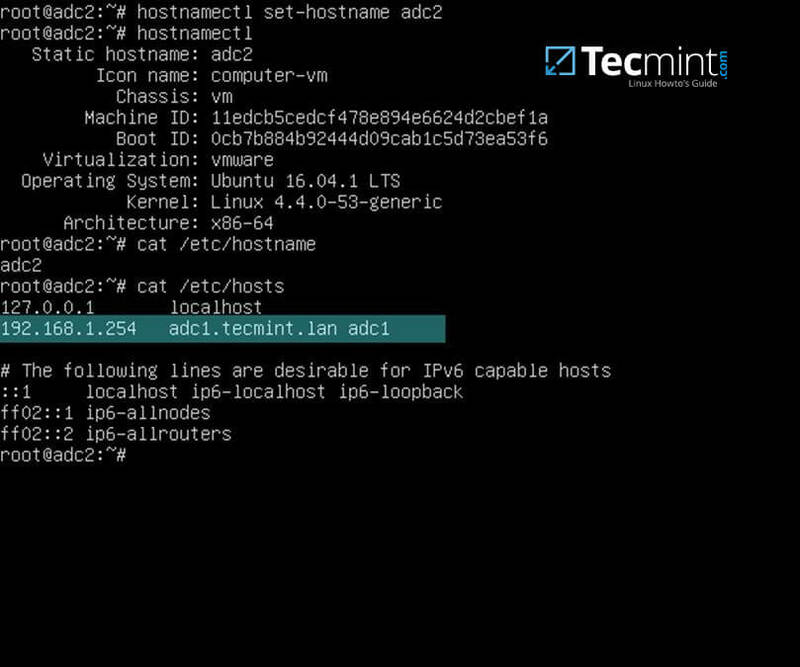 Before you start to actually perform domain joining for the second DC, you need to take care of few initial settings. First, make sure the hostname of the system which will be integrated into Samba4 AD DC contains a descriptive name. Assuming that the hostname of the first provisioned realm is called adc1, you can name the second DC with adc2 in order to provide a consistent naming scheme across your Domain Controllers. To change the system hostname you can issue the below command. else you can manually edit /etc/hostname file and add a new line with the desired name. 2. 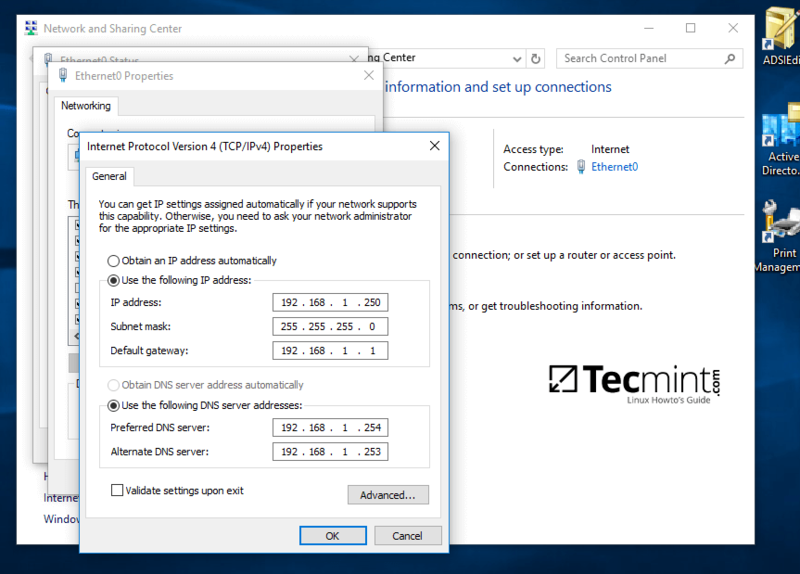 Next, open local system resolution file and add an entry with the IP address witch points to the short name and FQDN of the main domain controller, as illustrated in the below screenshot. 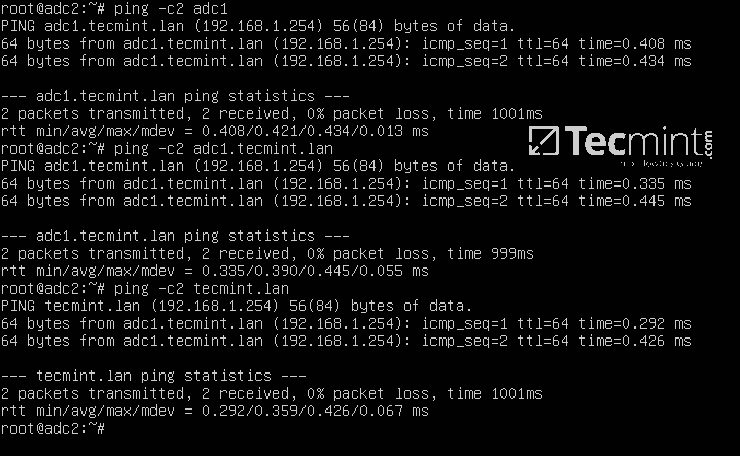 Through this tutorial, the primary DC name is adc1.tecmint.lan and it resolves to 192.168.1.254 IP address. 3. On the next step, open /etc/network/interfaces and assign a static IP address for your system as illustrated in the below screenshot. Pay attention to dns-nameservers and dns-search variables. These values should be configured to point back to the IP address of the primary Samba4 AD DC and realm in order for DNS resolution to work correctly. Restart the network daemon in order to reflect changes. Verify /etc/resolv.conf file to assure that both DNS values from your network interface are updated to this file. Restart network service and confirm changes. The dns-search value will automatically append the domain name when you query a host by its short name (will form the FQDN). 4. In order to test if DNS resolution is working as expected, issue a series of ping commands against your domain short name, FQDN and realm as shown in the below screenshot. In all these cases Samba4 AD DC DNS server should reply with the IP address of your main DC. 6. Assuming that you want to manually force time synchronization with samba4 AD DC, run ntpdate command against the primary DC by issuing the following command. 8. During the installation you will need to provide Kerberos realm name. Write your domain name with upper cases and press [Enter] key to finish the installation process. 9. After the packages installation finishes, verify the settings by requesting a Kerberos ticket for a domain administrator using kinit command. Use klist command to list granted Kerberos ticket. 10. Before integrating your machine into Samba4 DC, first make sure all Samba4 daemons running on your system are stopped and, also, rename the default Samba configuration file in order to start clean. While provisioning the domain controller, samba will create a new configuration file from scratch. 11. In order to start the domain joining process, first start only samba-ad-dc daemon, after which you will run samba-tool command to join the realm using an account with administrative privileges on your domain. 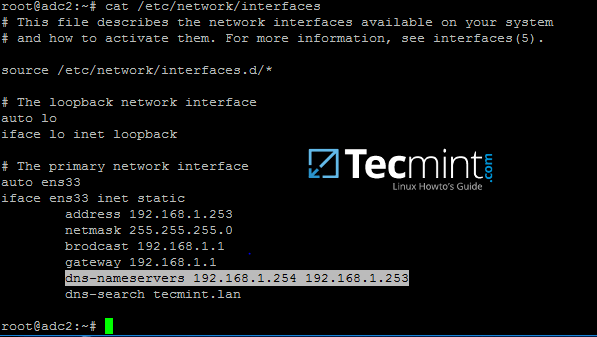 # samba-tool domain join your_domain DC -U "your_domain_admin"
# samba-tool domain join tecmint.lan DC -U"tecmint_user"
Add following excerpt to smb.conf file. Replace dns forwarder IP address with your own DNS forwarder IP. Samba will forward all DNS resolution queries that are outside your domain authoritative zone to this IP address. 13. Finally, restart samba daemon to reflect changes and check active directory replication by executing the following commands. 14. Additionally, rename initial Kerberos configuration file from /etc path and replace it with the new krb5.conf configuration file generated by samba while provisioning the domain. The file is located in /var/lib/samba/private directory. Use Linux symlink to link this file to /etc directory. 15. Also, verify Kerberos authentication with samba krb5.conf file. Request a ticket for an administrator user and list the cached ticket by issuing the below commands. 16. The first test you need to perform is Samba4 DC DNS resolution. To validate your domain DNS resolution, query the domain name using host command against a few crucial AD DNS records as presented on the below screenshot. The DNS server should replay by now with a pair of two IP addresses for each query. 17. These DNS records should also be visible from an enrolled Windows machine with RSAT tools installed. Open DNS Manager and expand to your domain tcp records as shown in the below image. 18. The next test should indicate if domain LDAP replication works as expected. Using samba-tool, create an account on the second domain controller and verify if the account is automatically replicated on the first Samba4 AD DC. 19. You can also create an account from a Microsoft AD UC console and verify if the account appears on both domain controllers. By default, the account should be automatically created on both samba domain controllers. Query the account name from adc1 using wbinfo command. 20. 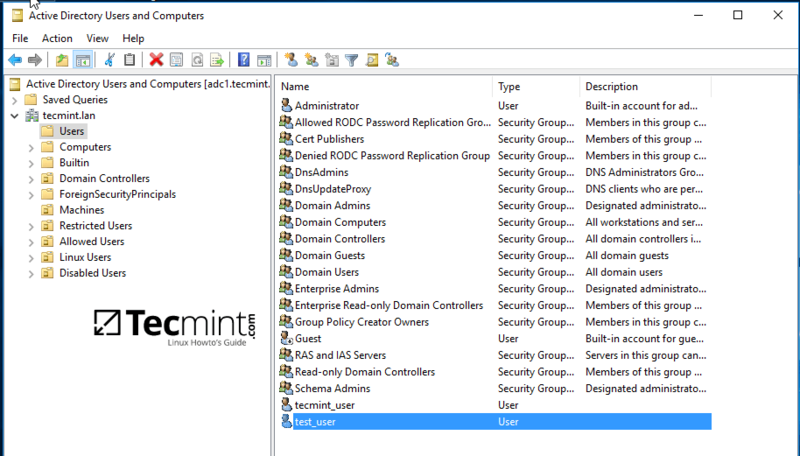 As a fact, open AD UC console from Windows, expand to Domain Controllers and you should see both enrolled DC machines. 22. 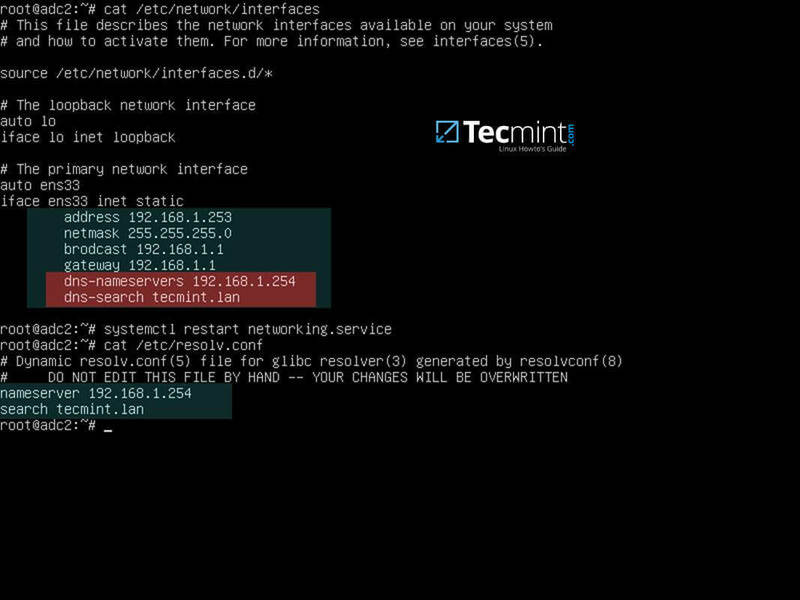 If you remotely administer Samba4 domain controller from a Microsoft client or you have other Linux or Windows clients integrated into your domain, make sure you mention the IP address of the adc2 machine to their network interface DNS server IP settings in order to gain a level of redundancy. 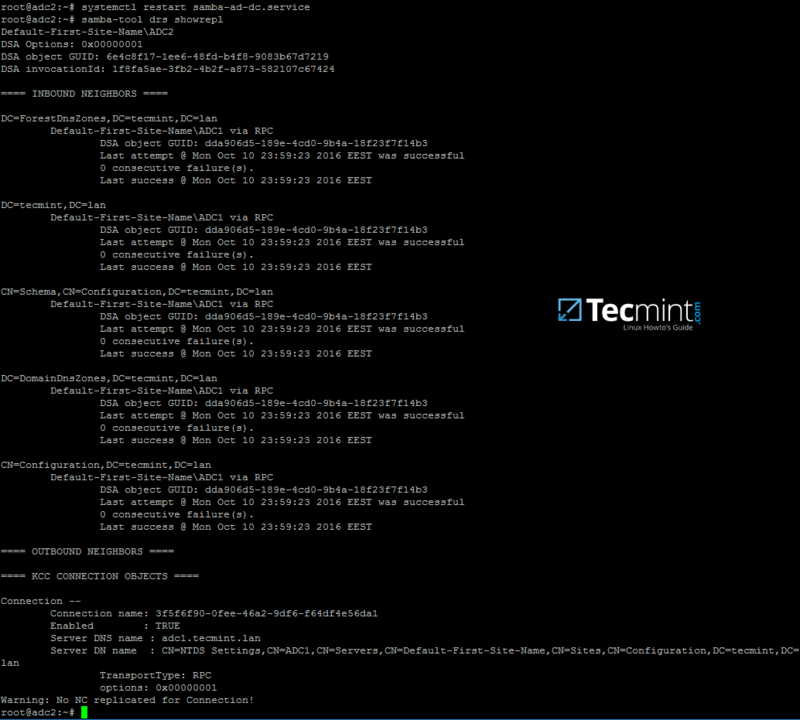 The below screenshots illustrates the configurations required for a Windows or a Debian/Ubuntu client. Assuming that the first DC with 192.168.1.254 goes offline, reverse the order of the DNS server IP addresses in the configuration file so it won’t try to query first an unavailable DNS server. Finally, in case you want to perform local authentication on a Linux system with a Samba4 Active Directory account or grant root privileges for AD LDAP accounts in Linux, read the steps 2 and 3 from the tutorial Manage Samba4 AD Infrastructure from Linux Command Line. Question: if I have an existing Active Directory (2012 R2 forest and domain level) can I use this method to add an Ubuntu DC as my secondary? I follow all the steps, however, my second dc not replicating to the primary one. everything else seems successful. both machines came up as DC within the RSTAT tool, ldap and krb5 info was generated for both machine on rstat. Any thoughts ? You have a typo here on step 14. # samba-tool domain join your_domain -U "your_domain_admin"
If you have any idea, Could you help me? In this case ALL DCs will can act as full NS for DC. And the best way to test fail-over AD DC is to stop the first AD DC server, for one or 2 days, and to see if you can work as usually with any AD client. This is the best test that you can try. 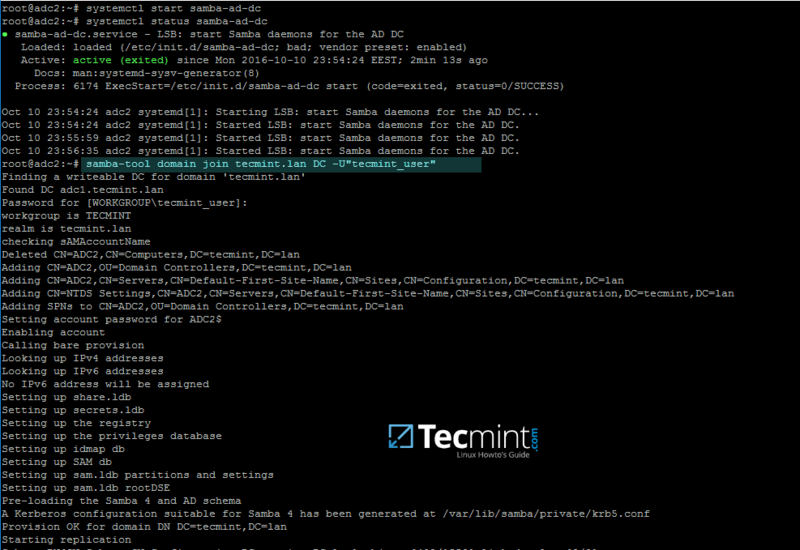 In my opinion, Step 3: Join to Samba4 AD DC as a Domain Controller could be …as a Additional Domain Controller. It ill be more clear. – on both AD DC you must put in resolv.conf the both AD DC ip address as nameservers. – on any additional AD DC you must setup the ntp in the correct way, if you do not go in problems – see a older tutorial from this series about samba4/AD. I also think it was wise to tell that if you run a samba file server on any AD DC server you need to reset the sysvol… and use rsync. Also kerberos could be improved so you can make a logon from different IP network/lan. As a side note the lower IP address are for servers (192.168.0.1 for example) and higher are for networks devices like routers (like 192.168.0.254), or I am wrong ? And the last sentence…. backup. If you loose all AD DC you loose everything, so make backups of everything, AD DC, multiple switching path, bonding and so on !